ManhattanBeachHomes.com Welcomes Mark Danaj, New City Manager. After helping Mark & Kate Danaj find their new home in Manhattan Beach, we had the pleasure of doing a quick Q&A with Mark to learn a bit more about him and his new role as Manhattan Beach City Manager. Mark and his wife, Kate, moved down from Northern California with their sons Gabriel, Joshua and dog Rockne. When asked why he chose Manhattan Beach specifically, Mark said he was drawn to the area because of its dynamic, urban coastal community that has an iconic past. He believes that there’s a lot to build upon as well as a lot of opportunities to do something differently. Mark and his family can’t wait to immerse themselves in the Manhattan Beach community. Speaking with Mark about his plan and vision for Manhattan Beach moving forward was not only exciting but incredibly inspirational as well. Q: What are you most excited about for your new role? A: I’m very excited to become a part of the city organization and work with the mayor and different council members. I want to honor the past successes of physical sustainability, quality programming, environmental awareness and conserving the coastline, while at the same time exploring new ways to digitize the city and engage the community online and via apps. Q: What’s one thing people might be surprised to know about you? A: I began my public service career as a lifeguard on a lake in suburban Chicago. Although I didn’t know it at the time, in hindsight it influenced my career greatly moving forward. Q: How/why did you initially get involved in city government? A: My dad spent his career in the army and the other half in the public sector. I’ve always been drawn to it from a young age. First working as a lifeguard and then working for my local county managers office. In many respects, local government is a place that works. Connection and accountability at the local level is a lot more evident than at the federal level. Consistently, polls show that local level government continues to receive broad support from residents among the country. Q: What are some of the most important ways people can get involved with the city? A: There are traditional ways to get involved with the city such as the city commission, public meetings, council meetings and newsletters. I want to augment the traditional ways with public surveys and online civic engagement tools that will ask people online to voice their opinions about specific proposals. We’ll be honoring the past but also shaping the future at the same time, while doing it with transparency and openness. Q: Since your arrival in town, what has surprised you most about Manhattan Beach? A: I was really surprised at how it just has a unique feel of being a small town and yet being almost urban and greatly sophisticated. Q: What’s one thing you’d like to have the most influence on in the city? A: I’d like the citizens and residents to feel that their local government is transparent and really working hard for them. By honoring the past and bringing in new and innovative ways to engage citizens. 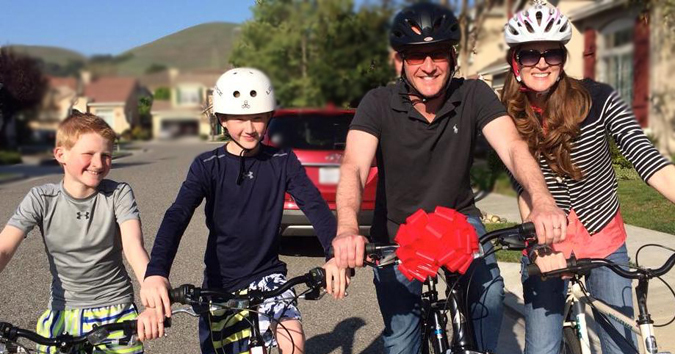 We’re honored to welcome Mark and his family into the community and call him a Manhattan Beach local. Please join us in congratulating Mark and welcoming him to the community by leaving a comment below. If you’d like to get involved with the City of Manhattan Beach, click HERE for further information.